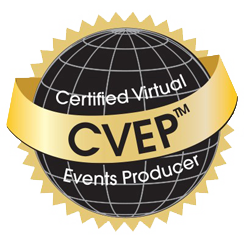 The CVEP certificate acknowledges expertise in planning and implementing virtual meetings and events for associations and non-profit organizations. To become certified, candidates successfully complete a six-week course, all assignments, and six module exams.Candidates receive the benefits of live interactive training sessions, interaction with fellow candidates, and an extensive virtual event planning kit. To support continuing education, candidates are given ongoing membership to the largest worldwide professional community of practice dedicated to the evolution of webinars, web meetings, and hybrid/virtual conferences. The iCohere Academy awards a digital badge to the candidates who successfully complete the Meeting Without Walls course and earn the Certified Virtual Event Producer. The badge is an online record of professional development activity and showcases the efforts of our CVEPs. Candidates can earn additional recognition badges by successfully planning, implementing, and providing evidence of each hybrid conference or virtual conference they execute. Digital badges are free to you as a benefit of being a CVEP. The badges provide a quick way to display your Virtual Event success, and can be easily linked on an email signature, Resume, LinkedIn Profile, Twitter profile, and other professional profiles in a way that is not possible with a paper certificate. *The Certified Virtual Event Producer (CVEP) Certificate is produced by iCohere, Inc. The granting of this certificate to specific individuals does not represent any official views of, positions of, or endorsement by those individuals, any association,any company, or any agency. Join 435 professionals who have already earned the CVEP™ designation. 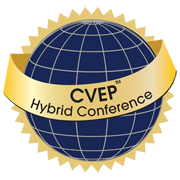 Only the professionals listed in this directory are verified CVEP credential holders. Renee Besanson Strategic Analysis, Inc.
Brooke Bilofsky Association Headquarters, Inc.
Susan Brenton Professional Direction, Inc.
Hope	Conway Canberra Industries Inc.
Michele Dillon Westover Consultants, Inc.
Caitlin Dougherty Association Headquarters, Inc.
Lana Dover Westover Consultants, Inc.
Sherri Downing Advocates for Human Potential, Inc.
Dara Hall Event Source Professionals Inc.
Karen Hutchison KBH Management, Inc.
Margaret Rowland Strategic Analysis, Inc.
Dixie Russell Offinger Management Co.
Lisa Scarberry West Virginia Primary Care Association, Inc.
Jenifer Schimmenti Strategic Analysis, Inc.
Connie	Seitz Meetings, Associations, and Events Management Inc.
Barbara Smith Strategic Analysis, Inc.
Jesse Strauss Strategic Analysis, Inc.
Roxann Thompson A-G Associates, Inc.
Sandra Thompson Westover Consultants, Inc.
Aisha Walker A-G Associates, Inc.
Pamela Wallace Westover Consultants, Inc.
Tara Weeks Strategic Analysis, Inc.
Aimee Wells Strategic Analysis, Inc.
"The Meetings Without Walls course improved the quality of the events I produce. I have been able to prepare for events more easily and can anticipate problem areas in order to be proactive. We have been able to increase production and the value to our membership through the virtual events we now bring to the table."